Many organizations and community groups rely on volunteers like you for a variety of food events for fundraising, fellowship, food pantries or other service to the community. But cooking for a crowd is tricky! How do you store all that food? When is the food completely cooked? How long can you leave food on the buffet table? Now there is a workshop on Safe Food Handling designed specifically for Volunteers. This class meets the Good Shepherd Food Bank food safety training requirements. Interested? Please request a workshop. 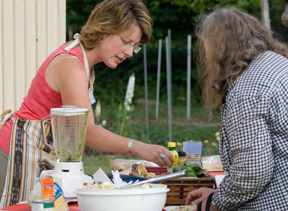 UMaine Extension programs are open and accessible to all in accordance with program goals. There’s a lot to learn about safe food preparation and handling. If you don’t do it for a living, you may not be aware of all the special techniques involved in cooking for a large group of people. It is scary to think about people getting sick from your meal, but it can happen. More than three quarters of the outbreaks are blamed on food eaten outside the home. While food-borne illness can be as mild as stomach ache, it can be much more serious and sometimes fatal. Unsafe food can “spoil” your group’s reputation — and its finances. Don’t take a chance. Sign up for the “Cooking for Crowds” workshop. Learn to protect yourself and the people you feed. Learn up-to-date methods for safely preparing, handling and serving food for large group functions such as soup kitchens, church functions, food pantries and community fundraisers. Materials fee: $15.00 per person.